Students of SIMSREE got an opportunity to attend the YI Mumbai Chapter meet which was attended by some Great Personalities like Past President of Commonwealth Alliance of Young Entrepreneurs (CAYE), Ms. Fatin Arifin and the Founder of CAAYE-Asia Dr. Rahul Mirchandani. The Event, held at the Confederation of Indian Industries (CII) Western Region HO, started off with welcoming Attendees from some of the most reputed MBA colleges of Mumbai. Dr. Rahul gave a brief overview of the session and walked students through the great achievements of CAYE and YI over the past 3 years. Ms. Fatin then talked about the tremendous impact that CAYE has had on various issues around the world. A few of the members from the YI Net shared their experiences of attending the CAYE summits in Kuala Lumpur and Malaysia. Their reactions clearly underlined the presence of CAYE in the world and the potential for change it bestowed on the members associated with it. It could be seen as a microphone amplifying the voice of the YI members. The session continued with a brief interaction with Mr. Waqar Masud, the representative of the CAYE from Pakistan and he shared some of the details of the next big bang event of CAYE to be held in Islamabad in the month of September this year. "Geography is History" claimed Mr. Rahul excitedly as he focused on how CAYE has helped people break national barriers and helped Young Entrepreneurs around the world to connect with each other with the help of the vast network that CAYE has been able to build and nurture that is continuously growing. 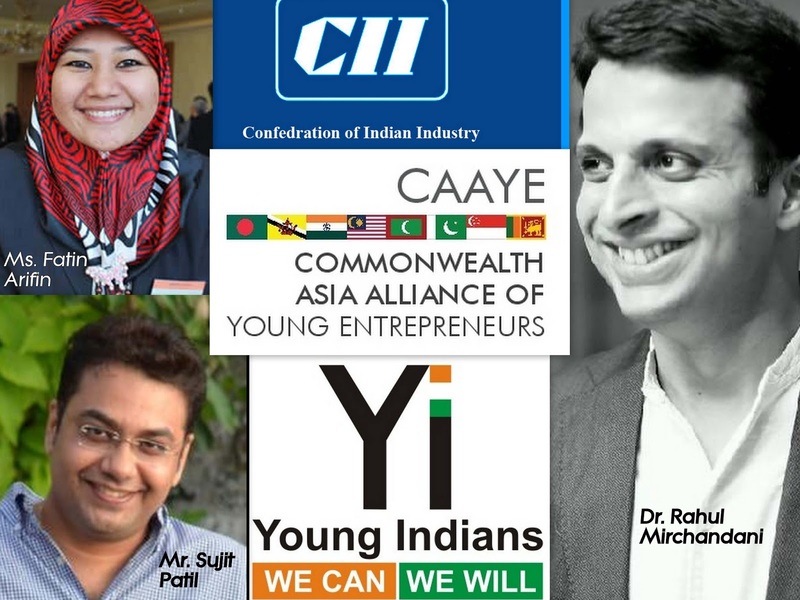 The session was concluded by Mr. Sujit Patil, who heads the Corporate Communications at Godrej Industries and is the Chapter Chair of YI Mumbai, by introducing attendees to the world of opportunities the CAYE can present to the future Entrepreneurs. Thanks to Mrs. Sangeeta Pandit Ma'am, the Chairpersons and the General Secretaries for this opportunity which proved to be useful to the students and representatives from the Student Social Responsibility Committee, The Placement Committee and the Entrepreneurship Cell of SIMSREE. The stock newsletter is perfect new reference which can be used by many around the globe eager to try their luck in the field of stock or share market. The best and the most important thing about stock market is that it is providing all individual suitable options using which you can learn more about different share market, refer to stock market newsletter. There are lots of information about latest technology and how to get trained in them, like this have spread around the web, but this is a unique one according to me. information above provided was really very interesting to read about. i just loved the way author described each and everything in detail. thanks for sharing such an amazing post. There are various types of MBA Degree Programs in indiadepending upon's one's need. There is lots of Top MBA Colleges In India. Thank you for informative article. Do you have any question to be asked related to Personal Finance or Do you want to help others by answering their questions. Please feel free to submit any of your questions regarding personal loan, car financing, home loan, Auto insurance, health insurance, travel insurance, credit cards, bank accounts, debit cards, investments or broadband internet services across Pakistan. Lets be a part of community who cares about others. We are just one click away to provide you any guidance and answering your questions. Please join our Community Forum so that others can benefit from your knowledge that you share across and also let us help you by answering or guiding you through.